When golfing in Thailand I find that staying behind the golf ball is one of the most difficult things for me to do. There are so many on courses distractions and my body has a tendency to move ahead of the ball when I swing. 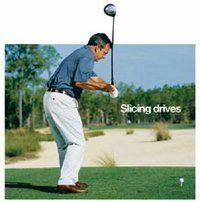 In doing so, I have developed an outside-in swing, which can be seen in the stop motion video swing analysis picture at left and causes such familiar troubles as slicing and topping. This is particularly true on the drive, which I also often try to hit with too much power. Over the last year here in Thailand, I have focused and learned to stay behind the ball and would like to share with you exactly how I was able to achieve this feat. A Thai golf professional showed me this simple but effective practice exercise in which the ball is teed somewhat higher than usual using extra-long tees, or the longest rubber tee given out at one of the Bangkok driving ranges. When the ball is teed up this high, I find that I must literally swing from the inside out in order to hit it at all solidly. In addressing a ball which is teed higher than usual, I also find that setting the club head about three inches behind the ball helps me hit through it squarely. The value of this drill, as I discovered, is that it emphasizes the right hitting habits. It delays moving my upper body out of position and ahead of the ball before impact and stops forward away movements of my lower body. I also find that, with my body positioned properly behind the ball, I have less of a tendency to steer the ball and I finish my swing much higher. I think you will also discover that, when you go out on the course after this exercise, that you will repeat this correct hitting action when the ball is teed at its normal height. This inside to outside swing plane has allowed me to almost eliminate those dreaded weak slices from my game and in some cases has even facilitated a slight draw in my shot. I estimate that I have been able to shave off 3-4 strokes form my average score by getting rid of those nasty OB’s and/or avoiding bad trouble off the tee, especially on the tighter courses around Thailand. Give this simple tip a try and let me know how it works for you. Feel free to post any swing improvement comments here or drop me a line at my Thailand golf vacation company.